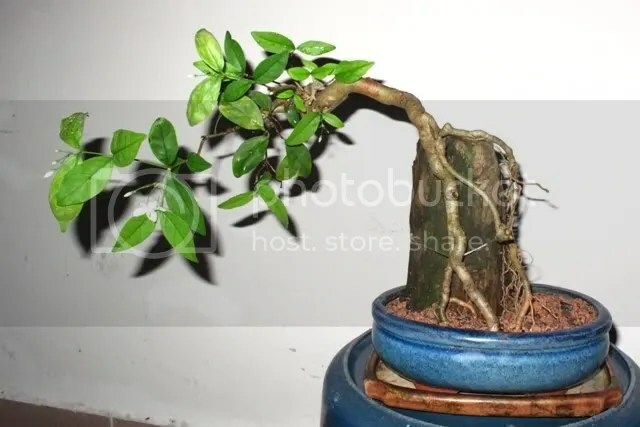 Based on my observation, half of a decade is just a short time for a bonsai trainer to create their tree. They take longer time to enjoy petting their tree. It is not like keeping a pair of pigeon in which they will breed and multiply in no time. Bonsai is about patient, not just passionate. To see it slowly grow in front of the eyes for years is something really valuable, and has a high sentimental value. The crowds were not that many as the target group was just the people from the nearby villages, to be specific, under the DUN (state legislative assembly) Panchor. 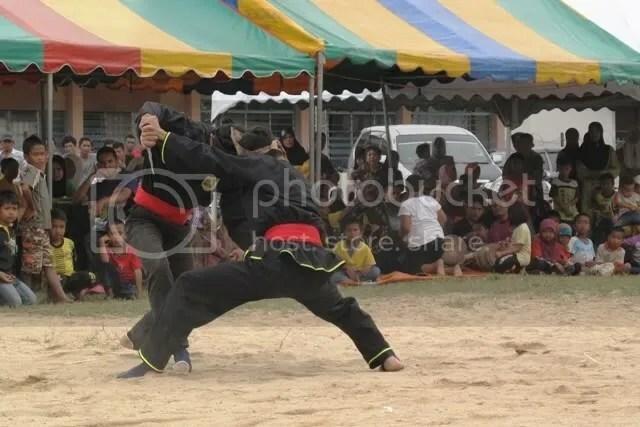 According to the organiser (under the Panchor assemblyman, Dato’ Mohd Amar Bin Nik Abdullah) , there were about 10 school of martial arts were invited to perform in the carnival. 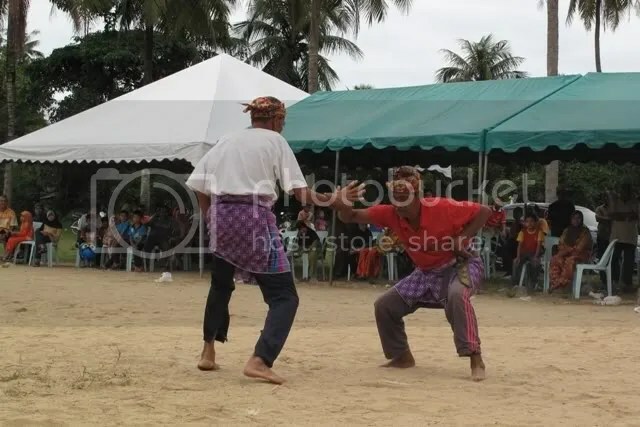 There were a variety of Malay martial art schools performing in the carnival, such as Silat Jatuh, Silat Seni, Silat Tempur, Silat Batin and Tomoi. 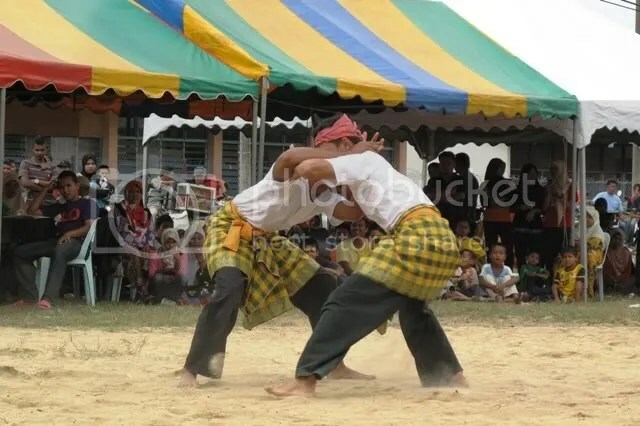 The traditional gendang silat from two groups were also being played alternately throughout the events. The Gayong team from SMU Panchor did a good job in their pentas. A bit more sweat and blood in their practice would make better. The tomoi or boxing partners also taugh. 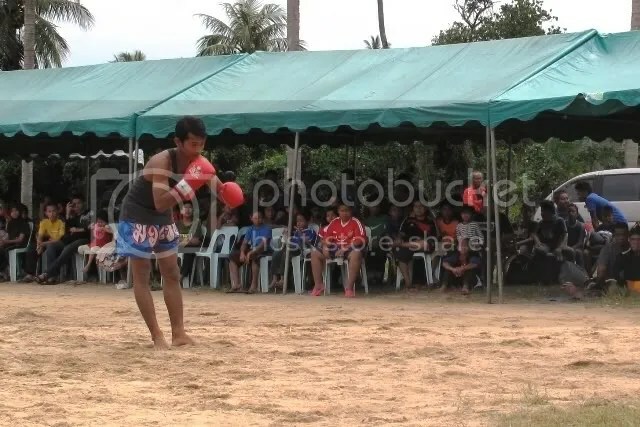 Although it was just a light sparring, some of the movements were really solid. 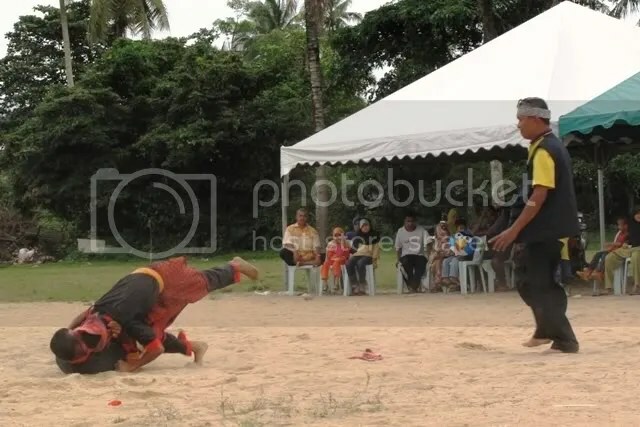 The Silat Jatuh performances from various schools were also great. A lot of their flowery movements consist of hidden philosophy and meaning. However, a couple of pairs really spoiled my mode. Although their movements were unquestionably great, I think that the performances were too much of comedy acts. Perhaps their real intention was to entertain others especially the women and children. 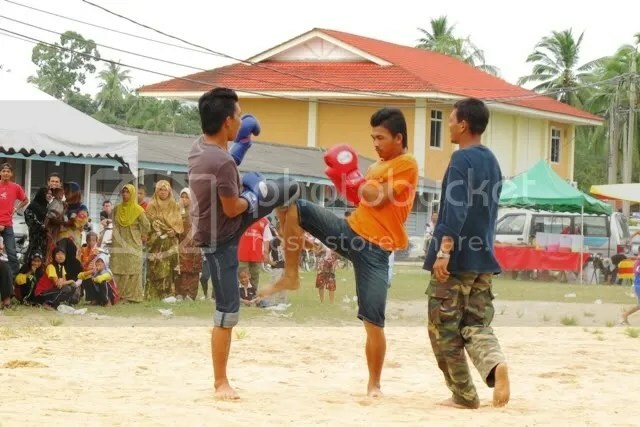 However, I do not think that silat should be known as something funny as we are not in the colonial era anymore. 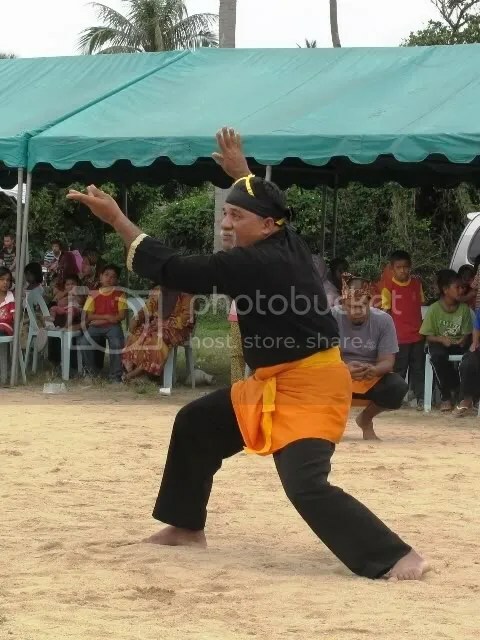 Silat should be known as the protector and pride to its practitioner. The last performance to close the carnival, by two grandmasters. I believe that this kind of event should be made as example to the other places in Kelantan or Malaysia in general. 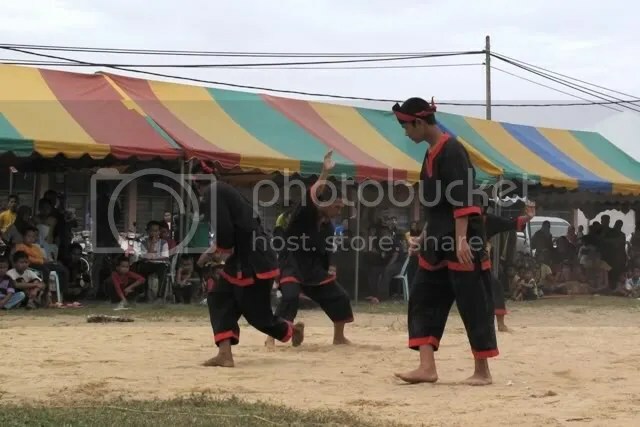 This event will eventually bring up the name of the local martial arts especially the traditional and low profile ones. It can also motivate the young generation to participate and contribute in continuing the legacy of our ancestors. P/s: The weather was perfect all day long. The sun was gloomy, hidden behind the thin clouds which gave enough shade to the participants and audiences of the carnival. Later that day, I was told that Tok Guru Hj Hussin Ibrahim Lubuk Tapak has gone meeting the God. No wonder the feel and mode was a bit melancholic. Al Fatihah. I have got a new toy. I found it at the back of my home. I have little knowledge about the species. What I know is that I have once grew the kind of tree when I was a little kid. My new bonsai. Hopefully it will stay alive and grow up healthy and strong. 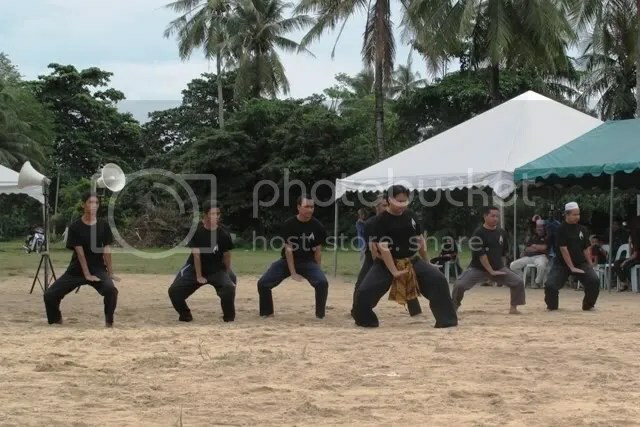 Following the SOP (standard operational procedure) after the Keris Course that we just had, some might get excited with the postmortem of the course. Some may eager with the planning of the next course, while some others might concern about the bruises, cuts and pain in the muscles that they had. However for me, the excitement comes when I clean the kerises. 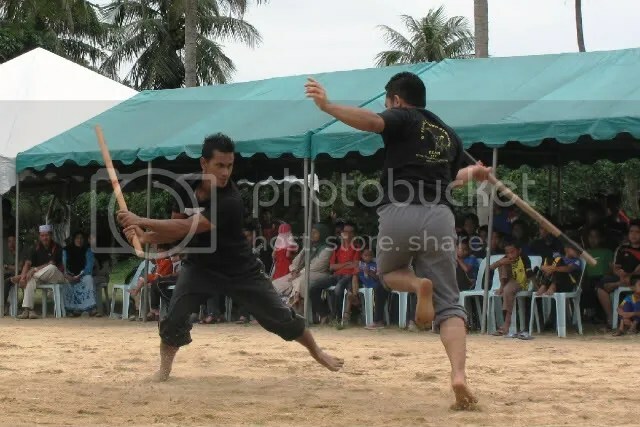 As usual, for those who did not have their own keris yet, they had to borrow them from others, especially from Ayah Su. 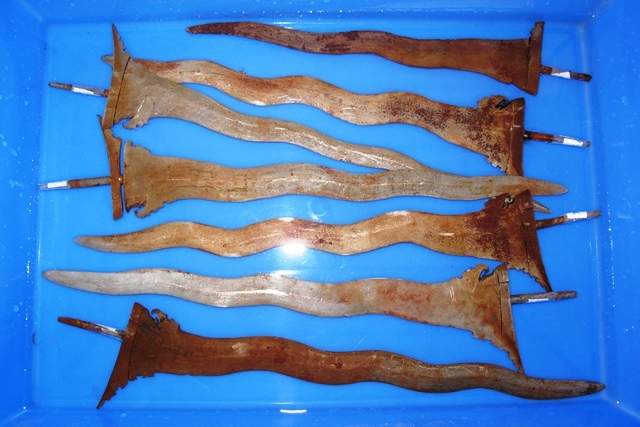 This time, I had the privilege of cleaning them, or to be particular take out the rust from the blade for restoration. Take the hilt out from the blade. 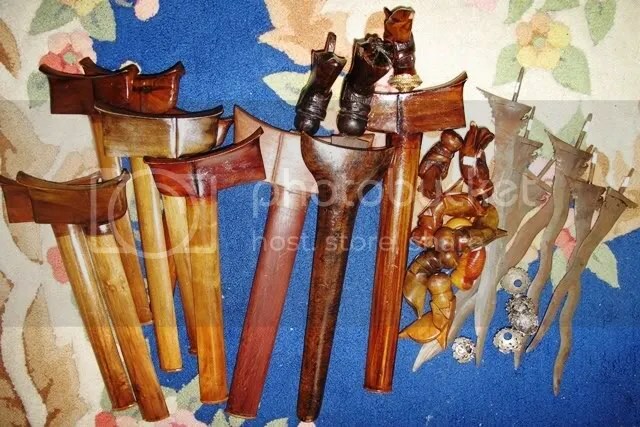 If there are a few kerises, make sure that you labeled both the hilt as well as the blade properly to avoid confusion when you want to put the hilt back to the right keris once you have finished cleaning the kerises. Soak the blade in vinegar for a few hours. If the rust is still hard to eliminate, soak them longer, a night perhaps. Brush the blade with the cuts of lemons. The acid liquid from the lemon can sweep away the rust faster. Once the blades clean, wash the blade with the body syampoo, or soap, or dish washer liquid. This is to neutralise the acid traces that still exist on the blade surface. Wipe the blades with a cloth till they dry. Put some fragrance and/or olive oil on the blade surfaces. This is to make sure that the blades do not rust easily. Make sure that the blades are not touched by the bare hand as the blade can rust easily with the touch. Put the hilt back to the blade. Now it is ready to be stored before the next use. This is the way I clean kerises. Other people might have different techniques by using different material. huhuhu. No worries as the objective is just the same which is to clean the kerises so that they are well cared and kept. Although the procedure seems simple, the satisfaction that I get in cleaning the blades is extraordinary. huhuhu. These are some of the processes that I have encountered during my wedding. 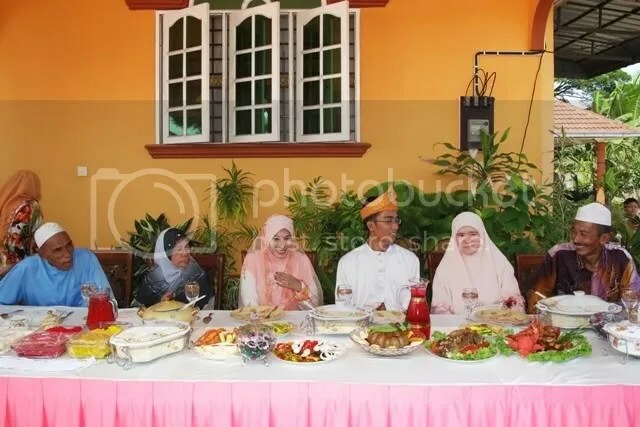 Although the word wedding seems simple, it actually contains quite some lengthy process which follows the needs of Islam as well as Malay custom, and in my case it is narrowed to the Kelantanese culture. At first, I did question about the needs to follow all the rigid rules and customs as for me, the procedure is just for the ‘Akad Nikah’ and that’s it. All others was considered as extra burden. However, that was just an old me. Now, after undergone some part of the process, I realise that there is an enormous agenda behind all these customs, which is to make my wedding life better. This is the first formal step in getting marriage. Before the process takes place, the parents and family members from both sides have already had a general idea about what is expected from the person from the other side. Before the actual meeting takes place, they usually have asked people around, used spy, done some investigations or maybe asking the person herself in order to get answers to some basic questions about the person and her family. The questions may centered on the four basic things suggested by the Prophet (SAW) “A woman is married for four things, i.e., her wealth, her family status, her beauty, and her religion. So you should marry the religious woman [otherwise] you will be a loser”. In my case, we have done some funny investigations as well. After getting agreement from my parents and closest relatives, we move on to the merisik (formal inquiry) stage. The merisik is a meeting whereby we went to my spouse’s place (not yet at the moment) and indirectly asked whether the girl is available or not. That was the moment when I had the first glance on my wife. The meeting also means that I was able to contact her (within the limit of the religion, haram things before is still haram after the merisik stage) in order to know her better and if she meets the criteria, to discuss the preparation for the next stage. Engagement is the stage where both parties are really commit to the marriage. There should be no U-turn after the engagement unless there is really big war without any solution happens. To be play safe, the news on engagement should not be public as it would give a shame to both parties especially the girl’s side if it is ended up with a break up. We bring along with us 7 things (pahar) as gifts to my spouse and her family. It can be any number as long as it is an odd number. 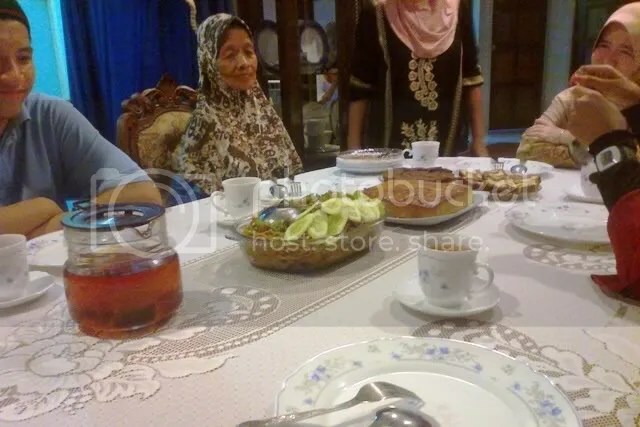 Some of the compulsory item needed in the 7 pahars are sireh leaves where the ring is put, the yellow glutinous rice paired with egg (pulut kuning and bunga telur), some cloth, some fruits, some food (usually cake) and last but not least a book (usually Al Quran). All the gifts are a complete things needed in one’s life. Each symbolises important things that is needed to have a prosperity life. The marriage contract is the real deal. This is usually the stage which make the bridegroom shaking the whole body, freezing under the room temperature or perhaps suddenly becomes a stammer. Shaking hands with the religious officer or the wali (guardian) himself and utter one single sentence has become the heaviest things to do. Reading the contract is among the most scary part in a man’s life. There is also Mas Kahwin (sum of money or anything (i.e. Al Quran, gold) as a gift to the bride) that the bridegroom needs to give. The quotation price is up to the bride to decide. There is usually a range of standard price given based on the trend around the place. However there is also a trend in which the bride does not put any specific price for the gift. It is up to the bridegroom to decide. If the money is not used for the wedding ceremony. It is suggested that the gift is given in Gold Dinar or maybe properties with high probability to rise in the future. The different that is seen in the Kelantanese wedding and other states in Malaysia from my point of view is that the Kelantanese does not have the additional allocation for the ‘wang hantaran @ wang hangus’ (or burned money). 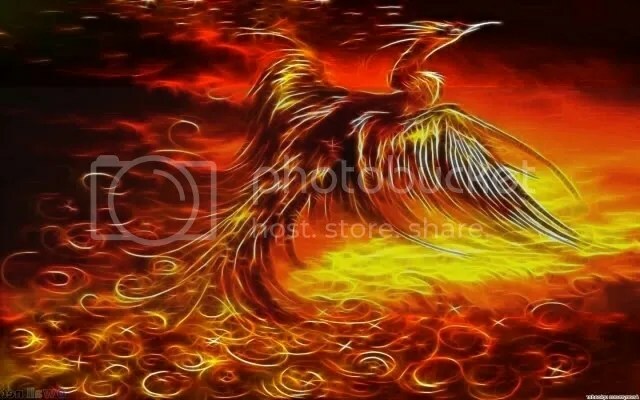 The burned money is paid prior to the wedding to the bridegroom as the down payment that is usually used for the wedding ceremony for the bride’s side. The sum is usually a lot higher than the Mas Kahwin. If it is just a gratitude ceremony, the guesses can just come to the ceremony and enjoy the meal. They might also want to bring along a gift or alms to the couple such as giving simple things as simple as a kilogram of sugar. Giving money to the host is considered as rude perhaps because the host believes that they are serving some food to the guesses as a gratitude to God and only God can indirectly repay it, in term of happiness, health and etc. For the invitation which is stated as a wedding ceremony, the guess is allowed to give present or money to the host as the alms. Maybe it is to lessen the burden of the couple when they live together in a new house or place. Then, the bride is delivered to the bridegroom’s family house. 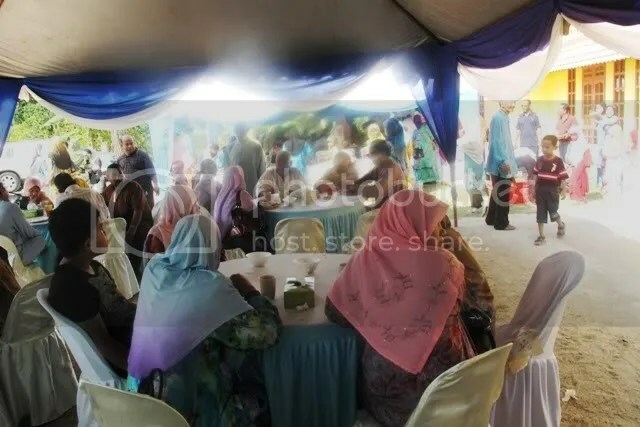 Another wedding ceremony is usually held as to inform the relatives especially the distance relatives of the bridegroom’s side that the person is already wed. If the the host has enough force and strength in term of people come to help to set up everything, then the host can think of cooking the meal from the scratch. But if not, paying the catering service is preferred. 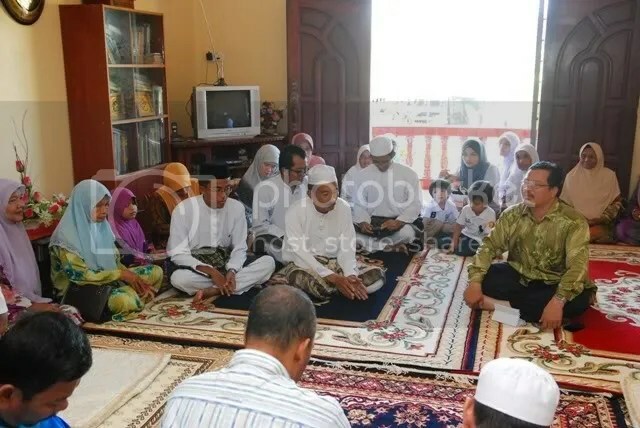 The is also an unwritten rules whereby the bridegroom cannot go to the bride family’s house before she is officially sent to the house during the menyambut menantu ceremony. It is one of the extreme case scenario. The linear rule would be that the bridegroom can go to the bride family’s house but she cannot stay there too long or sleep at the house. Another new thing that I have learned when I got married was that my wife is not allowed to go to her parents’ house until my parents send her. Perhaps this custom is rarely practiced because of some hindrances such as geographical and time challenges. After the ceremony, the newly wed couple would probably hear the sentence sounds like ‘Ajok la Paih/Na gi jale kenal rumoh’ (Invite your spouse to our house) uttered by the close relatives. They would usually serve the couple with heavy meal and give some gifts as presents. I felt blessed because everything runs smoothly. Hopefully it is a good sign from God who has planned all the events for me. The whole process is now complete. It is now the time to explore the depth of understanding and patience with each other, with the strength of the mahabbah and rahmah thrown by the Creator to the heart of both of us, as husband and wife, and the big families that we have. It should be noted that the customs are not compulsory to be followed. If it becomes a burden especially the financial burden to a person, the simplest akad nikah is more than enough. Physical contact and relation (or something towards that) before marriage for any reason (i.e. postponing the wedding because of financial burden) should be avoided. Parents should aware that the customs can hold but some evils for postponing the wedding can’t. It can only be stopped by marriage. The entry post might be just my syok sendiri perspective. Any correction or additional information is most welcome. huhuhu. Wallahua’lam. 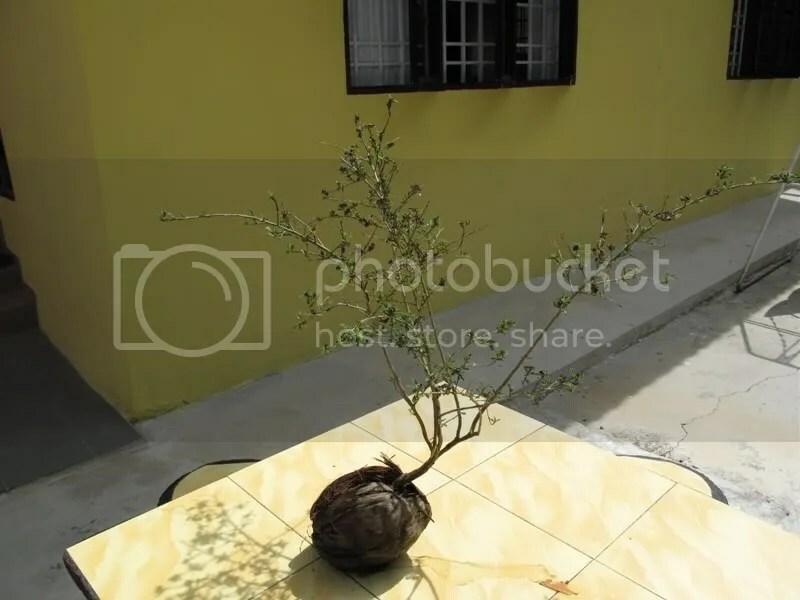 Typical pisau lapah that can be found in Johor. 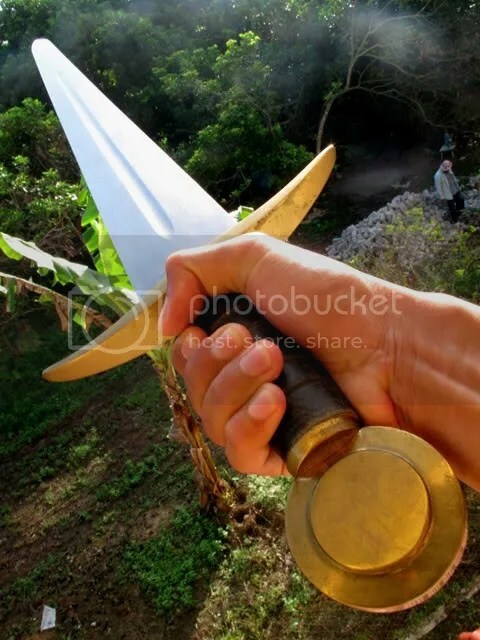 Looking at the blade, can it function as parang (small machete) as well? 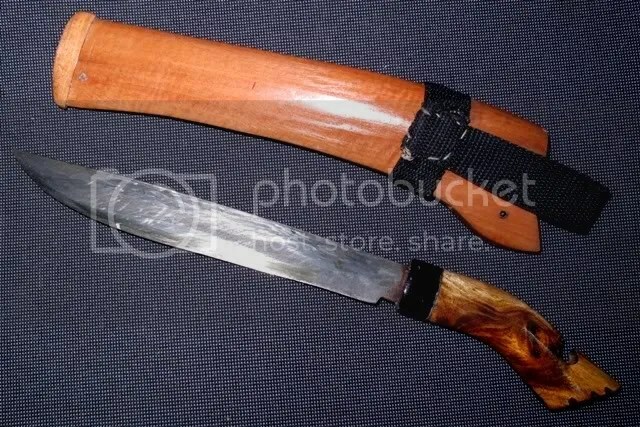 Can I use it to cut small trees if I go into jungle or do something like that? Can such activity damage the blade? I was a big fan of Ebay when I was in UK. The fact that Pound Sterling was expensive compared to other currency made everything seemed to be really cheap. I would spend hours just browsing through the web looking for interesting items to buy. 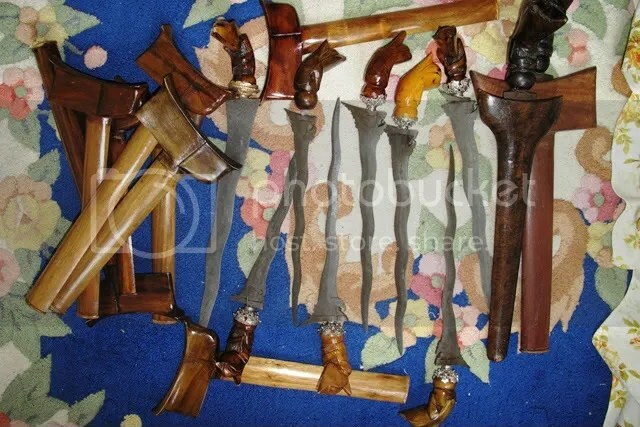 One of my interest was to browse buy for weapons. 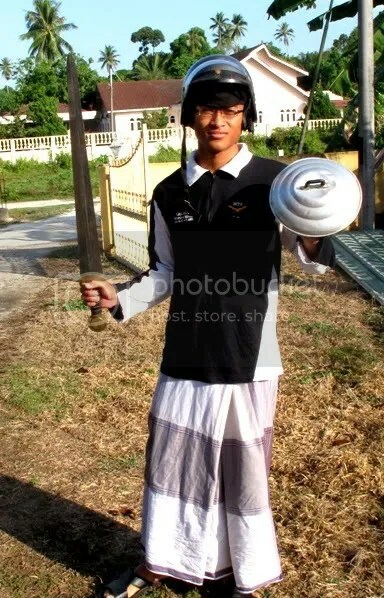 One day, I found one interesting sword, which was very affordable. 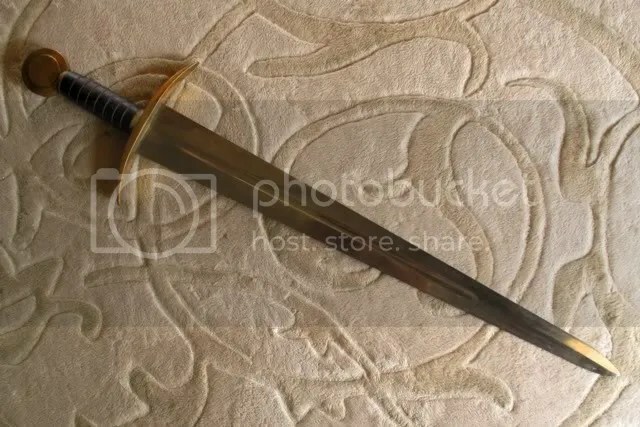 According to the seller, the sword was made in Toledo. It is a sacred place which specialised in producing weapons for war during Al-Andalus era. I have just got two bangles this week. Later, I went for my PSV lesson. 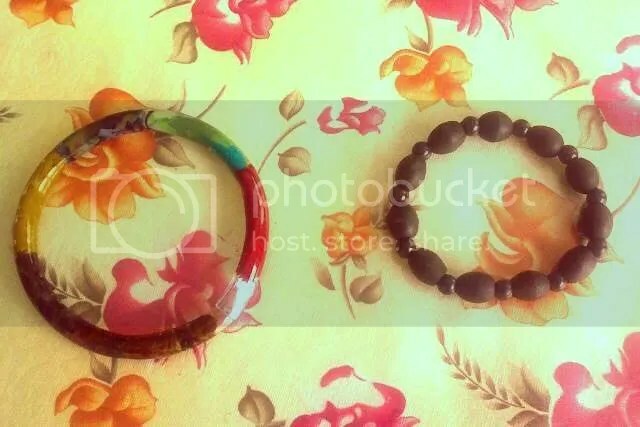 We made bangles by using plastic tube and pieces of batik, cooking oil, and a lighter. Firstly, cut the plastic tube into a few inches length depending on the student’s hand size. Then, cut the batik into about 2×2 inches pieces. Dip the rolled batik into hot cooking oil to make the batik pieces look shiny. Then insert the batik into the plastic tube. 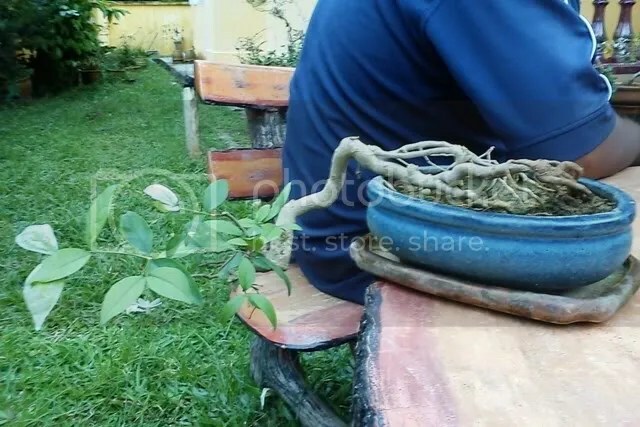 You may want to use ‘satay’ stick to push the batik into the tube. Do the same procedure until the whole plastic tube is almost full. Just leave about half inch of both ends empty. After that, attach both ends of the tube by inserting one into another. Press one end to make it smaller. Then only the end tubes can be attached. Lastly, Burn the attached links a bit to make sure that both ends stick together. I must be thankful to a friend of mine who has introduced the product to me. My students have already asked my favor to buy the tube for them. Perhaps they want to make it commercial. The tube can easily be found in a hardware shop. It is sold for just 50 cents per meter.. A class which have 30 students will need about 6 meters tube. Happy experimenting.. huuu.